Standard Drug Company, 2010. Attributed Dudemanfellabra CC BY-SA 3.0. See source below. It is a long journey to get from 603 25th Avenue at the Capt. A. B. Avery House in 1889 Meridian to end up at 601 25th Avenue and the former Standard Drug Company at the beginning of 2017. Along the way there was an ice factory, soda water works, suicide by morphine, Hopkins & Bethea Drug Store, train wreck, drug store clerk named Alvin Fielder, Electric Bitters and Jamaica Ginger, Jake Leg Paralysis, Jake Leg Blues, Jake Papa Walk, rise and fall of the Mississippi Medical College, prospective home for the Elks, and Lottie’s Cafeteria, and that is what you missed in the last 127 years. The Era Druggists Directory of 1921 listed Mississippi’s drug manufacturing companies and drug stores. I was curious if any might still be in business, or if any buildings were extant. Before moving forward with the Standard Drug Company, however, we need to go back in history to the Avery House. [Residence of Capt. A. B. Avery] is so long gone that I can’t find any information about it, other than what I can derive from the Sanborn maps. Who was Capt. A. B. Avery, what happened to his house, and how did Meridian Medicine College end up in the same place? The Journal of the American Medical Association, 57 (1-13), 1912 indicated two medical colleges in Mississippi: University of Mississippi, Oxford, “giving only the first two years of the medical course” and organized in 1903, and providing the last two years in the clinical department at Vicksburg, organized in 1909, and Mississippi Medical College, located in Meridian on Fifth Street and 24th Avenue, organized in 1906. The Council on Medical Education and Hospitals, American Medical Association, 1914 edition of Medical Colleges of the United States reported the Mississippi Medical College of Meridian extinct in 1912.
Who was Capt. A. B. Avery? Using chronological information about A. B. Avery obtained from area newspapers, I have pieced together what I think is a fairly accurate story of Avery, albeit with gaps. According to the 1900 census, he was born in 1837 in Alabama. In 1863, Sergeant A. B. Avery was listed among the wounded from Company A, 45th Alabama with a severe leg injury (New Orleans Times-Picayune, 18 Jan 1863, p. 1). Based on the census records, Avery returned to Alabama after the war. His wife, Harriet, was 31 at the time of the 1870 census, and they had a daughter, E. (7), a daughter, M. O. (4), and son, C. B., under 1 year of age. The first mention I located related to Meridian is in 1880, when a Captain T. C. Beal (and I cannot determine when Avery took the title Captain), formerly from Hickory, died at Avery’s house (Jackson Weekly Clarion, 25 Feb 1880). ” A. B. Avery of Meridian” pops up in 1887, in connection with a railroad meeting (Times-Picayune, 20 Apr 1887) and a visit to Chattanooga (New Orleans Times-Democrat, 02 Oct 1887) where his daughter Eula Ramsey was living with her husband. Sad news came three years later. Charles B. Avery, the only son, was found dead in his room in Atlanta, Georgia. Charles was a drug clerk and had moved to Atlanta from Meridian two years earlier. His father was identified as a “prominent druggist” and “respectable druggist” in the newspapers. Death was ruled suicide as a result of drinking a morphine and water concoction. Charles had lost the second of two jobs in Atlanta. His body was returned to Meridian for burial March 21st, and the service was held at the Presbyterian Church (Daily Commercial Herald, 19 March 1892; Clarion-Ledger, 24 March 1982; Meridian Tribune). Recall that the building on the corner on the 1886 Sanborn map was identified as a possible drug store, coupled with the newspaper references, and we can surmise A. B. Avery might have been one of the early druggists in Meridian, although I found nothing to confirm that assumption. Capt. Avery may have moved to Houston, Texas following the sale of his home, as in February 1896, he visited Meridian, and was referenced as the “former owner of the beautiful Avery place” on a visit from his home in Houston (Times-Democrat, 2 Feb 1896). Also in February, an ad appeared that Avery had leased and begun running the Railroad Eating-house in Hattiesburg. Two months later, Avery almost died. He was dragged unconscious from the wreckage of the New Orleans and Northwestern train wreck that occurred just three miles north of Meridian at the Holicker Creek bridge. The bridge gave way and although the engine cleared the bridge, the rest of the train fell into the water below in the early morning darkness. Identified as Capt. A. B. Avery of Hattiesburg, he was almost drowned and had a serious head wound as his scalp had been lacerated to the point the skin was hanging across his eyes when he was discovered. (Times-Picayune, 15 Apr 1896). From 1899 forward, he apparently moved to Shreveport as an agent for the Texas and Pacific Railroad. The Avery House and Cleon Williams disappeared from the news until 1899. 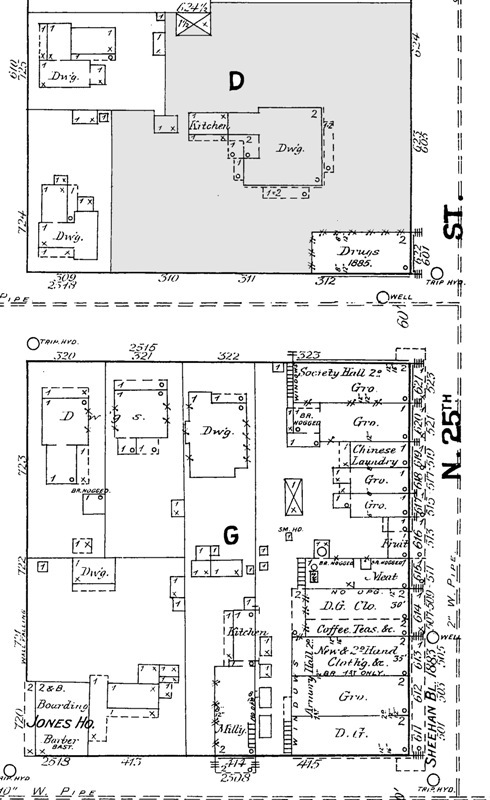 References appear for “Avery House” in 1899, 1902, and 1903, indicating a commercial establishment, and Malvaney reported the 1902 Sanborn map showed the location of the former Avery home as a boarding house. Mrs. Cleon Williams was reported as entertaining in her home “on the Highlands” (Highlands Historic District bounded by 15th Street/34th Avenue/19th Street/36th Avenue) in 1902, and articles referenced Mr. Cleon Williams (C. L.) as the city electrician and municipal engineer. I found no references to a Dr. Cleon Williams other than the purchase of the Avery home in 1893. Part II of the trilogy will explore the relationship between Hopkins & Bethea and the establishment of the Standard Drug Company, along with a side dish of patent medications and Mississippi blues. Part III will explain how the Mississippi Medical College figures into the story, including, how it wound up listed on the Sanborn map of 1912 in place of Avery’s grand mansion. Hats off to the author of this piece…and I’ve never even spent much time in Meridian. It’s an interesting, well researched story. Thank you.